Ever wondered what your music looks like? With Music Hop, you can see and hear your favorite music cascaded across the screen in 3D. With Music Hop, you can see and hear your favorite music cascaded across the screen. Watch as your screen fills with vibrant colors and music beams through your speakers - with Music Hop, your favorite tracks will never be the same again. Music Hop is unlike anything you have ever seen before. Watch as the artist and song title erupts, flowing into sound waves, adding a totally new element to your music. Feel the beat with 3D visuals, matching each and every sound as it bursts into your eardrums. 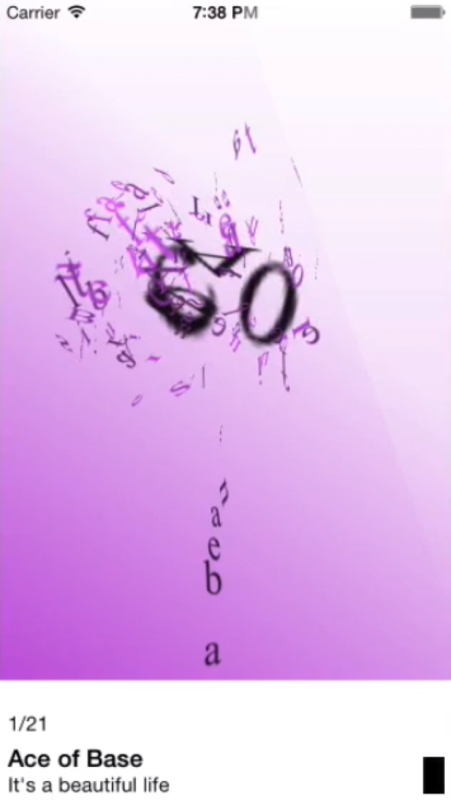 Play any song on your device and watch as letters form into shapes. Music Hop intelligently plays stunning visuals that match every beat and strum perfectly. Instead of just hearing your music, with Music Hop, you can actually see it. Take your music to the next level and express sounds in a whole new way! Create your own playlists and add a bit of life to the party! Music Hop is an interactive 3D music player that will leave you truly speechless. See the song title and artist name dissipate and let the party begin - Music Hop will take you on a journey of music and sound... and you have never seen anything like this before. Music has never been this beautiful - Music Hop. - Visualize your music in 3D! - The ultimate 3D music player! - Perfect for music lovers and party goers! - Take your music to the next level with Music Hop.